There are two types of people in the world: those that like Pearl Jam and those that are wrong. I've seen Pearl Jam twice in my life. The first time was when they played Lollapalooza '92. It was pretty much the best lineup of a concert ever. Other performers included Ministry, Ice Cube, the Red Hot Chili Peppers, and Soundgarden, among others. There was also the Jim Rose Sideshow and 30,000 screaming fans. The second time I saw them was in May of 2010. We missed the opening act. A packed HSBC Arena did not. Saturday night, I caught Buffalo-based Pearl Jam tribute act, "Unleash the Lion," at Evening Star Concert Hall in Niagara Falls. There were about two dozen people there. The rest of you missed out. The Evening Star is a great venue. You walk in to what looks like your standard corner bar but then off to the right, there's a huge room with a really nice stage, sound equipment and lights. It really is a concert hall. And because it's also a neighborhood bar, you always meet some interesting folks there. I wouldn't mind a better tap beer selection. And some food would be nice. But if wishes were horseshoes ... or whatever. Anyway, back to Unleash the Lion. They're a young band put together by Burgio, who also has a solo gig. The band and Burgio are both All WNY Music Award-nominated artists. And rightfully so. Burgio's got pipes. And the band sounds cohesive behind him -- despite some technical difficulties that they had Saturday. You should check them out sometime. Conveniently, they'll be playing another gig on Saturday (Oct. 15) at Central Park Grill. For a quick interview with Burgio following Saturday's show, check the podcast below. For more photos from Saturday's show, click here. 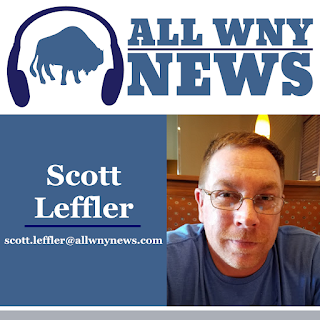 +Scott Leffler founded All WNY Radio in 2006 to offer more exposure for the talented musicians in Western New York. Occasionally, he may pen a column discussing one of them. Follow him on Twitter @scottleffler.